This time it’s not a single keyboard shortcut. 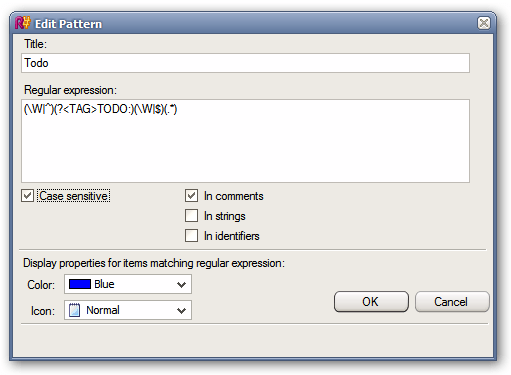 There’s a little known feature of ReSharper, called To-Do Items. It’s a series of tags, you can define, and when you put them in your comments somewhere in the code, ReSharper will pick the comment up and put it, in the To-Do Explorer Window. There are 3 predefined tags: TODO, BUG, NOTE and NotImplemented which picks up the NotImplementedException occurrences in your code. Yes, this is not a code comment, but most of the time you’ll use comments only. So how is this useful and boosts productivity? 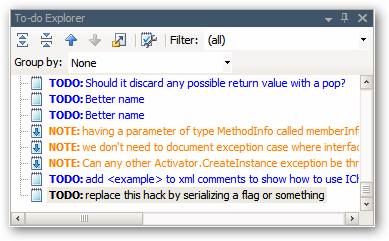 As you code your way, you can tag it with such comments, mostly for later review or to fix later. You can then immediately view all of them in To-Do Explorer, and jump to any of them. One thing I do however, is I redid the tags (defined via regular expressions), because the default ones used to pick up false positives. I changed the pattern to be case sensitive and to include a colon after a tag. To make use of this feature, I also keep my To-Do Explorer window always visible, to ensure that I do pick up the comments I, or any other developer on the team puts in the code. My team at work is far from agile, but I’m trying to smuggle some ideas and practices, according to the old Latin proverb “gutta cavat lapidem, non vi, sed saepe cadendo”. Recently, as a small way of continuous improvement I suggested each week we print some Visual Studio or ReSharper keyboards shortcut, that we didn’t know or use, and which can help us do some things a little bit faster. It’s pinned to a cork whiteboard in a location that everyone looks at it few times a day. Hopefully by the end of the week everyone will have it memorized, as we move to another one. And you? What small things you do to improve your skills (or your team’s)? This tool has been deprecated. I leave the download links as they are, but if you want to interact with Twitter from within Launchy you better check out updated version of this tool here. I uploaded a binary version of the tool, for those who don’t want/can’t deal with source code. When I’m in Firefox I use TwitterBar extension, that allows me to write posts in my address bar. When I read posts (tweets?) of other users in Twihrl and I want to comment on them, I use Twihrl to post. When I’m just doing something on my computer and I want to post without running Firefox or Twihrl I use my beloved app launcher – Launchy to post. This last option is a little bit tricky and it required a little bit of work to set up. I assume you have Launchy already installed. If not, go get it here. You’ll also need Twitt.Poster that we’ll be invoking from Launchy to do actual work for us. Just compile the project, set your username and password in app.config, and put the compiled files in some directory. Next, open Launchy, right-click it, and select “Options”. Then navigate to “Plugins” tab, and select “Runny”. This is the plugin, that will invoke Twitt.Poster. To make it do so, click the ‘+’ button at the bottom and add new entry to the grid. 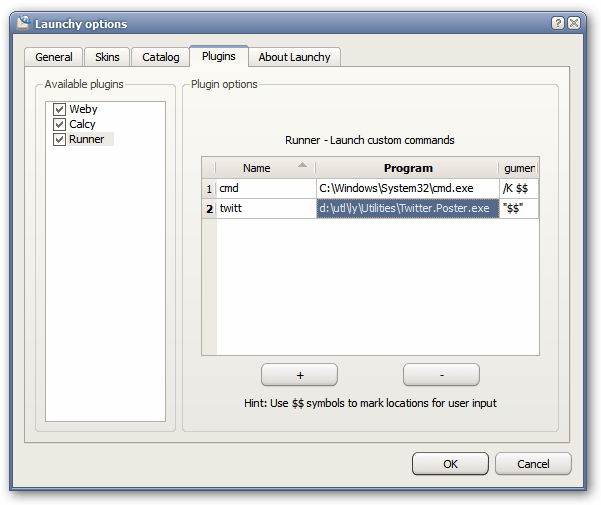 Name is the name of the command in Launchy – “twitt” in my example but you can call it whatever you like. Then Program is the fully qualified path to the executable of the poster application. Last column is command line arguments and you should set it to “$$”. Notice that you need to put dollar sings in quotation marks, otherwise it won’t work. When you’re done just click OK, and we’re all set. Now you can invoke the command in Launchy, press tab, and enter your message. When you’re done just press enter and your message should get posted to Twitter. That’s it. So far this is my favorite way of posting to Twitter. As for Twitter.Poster, use it however you like and don’t sue me if it breaks something. I publish it on terms of BSD licence. However, it uses Twitterizer library, that is licensed under terms of GPL v3, so take that into account when creating derivative work. This is just a sample application that I created mostly for myself. However you can post bugs and feature requests in comments. I don’t want to promise anything, but I may implement some of them if there’s demand and I find some time. Tool for managing windows services in Windows XP allows you many things, but you can’t unregister (delete, remove) a service with it. There is however a command line tool that allows that. Remember that unregistering important services may break your system. If you aren’t sure what you’re doing – don’t. You have been warned. First you need to check real name of the service (not it’s display name). To do this go to Control Panel–>Administrative Tools–>Services, and find the service you want to uninstall. Right click it, and choose “Properties”. Then, on the “General” tab, find “Service Name”. For example for service on the screenshot it’s WLSetupSvc. If everything goes fine, you’ll see command similar to second screenshot, and you’ll computer will continue working. I have contact with lots of different software. However yesterday I came across an application, that completely blew my mind… in a negative sense. This particular application uses its own custom file format, that is basically zip, with special files and folders inside, much like Open XML and Open Office file formats work. What’s different however, is that it requires you to have WinZip installed in order for it to work. And by WinZip, I mean WinZip, not just some generic compressing/decompressing program that supports zip format. This thing is so ridiculous that I just don’t know what to say. ANY software that requires the user to use some other specific tool is broken by design, but requiring your users to buy other commercial tool to do such basic thing as compression/decompression… it’s just rude. Well, anyway, as I really had no other choice but to use it, I decided not to give up and see how much it really needs actual WinZip. To do this I took invaluable tool from SysInternals (now part of Microsoft) called Process Monitor. With it you can see how processes on your system interact with each other and with the system. So I set it up, ran the evil program, made it do its thing, and then I could analyze what showed up in Process Monitor. When you install it, you have to point it to a directory, where you have your WnZip installed. Important thing to see here, is ‘filter’ attribute in Details column. The way I understand it, it tells us, that the program was looking exactly for “winzip32.exe”. So it seemed like it doesn’t use WinZip’s libraries, nor it’s (if WinZip actually has one) automation model, but it just call winzip32.exe with command line parameters. It seems, that WinZip’s command line parameters are not public, but this little site, helped me with that. At this point, it looked like all this application really needs, is a executable called winzip32.exe that supports few of WinZip’s command line parameters. All I needed to do, was to find one. Unfortunately, after checking out few free compression/decompression tools I wasn’t any closer to the solution, as none of them would interpret those parameters the way WinZip does. I sometimes come across a website that pops up a window with some video, chat or something, but its size is fixed, and it doesn’t fit in it, when opened in Firefox. I used to move that tab to the main window, where I’m able to resize it, but I don’t like doing that. I want to be able to resize that stubborn window in the first place, so I found a way to do just that. double-click it in order to change its value. Changes take effect immediately, so you don’t have to restart your browser or anything. Now, you can resize any window.